period, popular activities at the Kominkan included women’s empowerment, a better quality of a healthy life, income generation, and recreation activities. The Social Education Law, based on the Fundamental Law of Education in 1947, came into effect in 1949, when more than 10,000 Kominkan had been established. The concept of Kominkan is today to promote mutual learning and teaching and to support voluntary learning among local residents. 16,000 Kominkan provide space for activities and programmes for life skills, hobbies, and culture. A total of 244 million par ticipants came to 473,000 courses held by Kominkan in 2005. Kominkan is generally located in an elementary school. 70,000 autonomous Kominkan, but no official figures at national level are available. The local residents can request and develop programmes they want to learn for their own purposes at the autonomous Kominkan. Enzan Kominkan, located in nor thern Japan, is a small but active Kominkan. The latest activities are displayed on their Facebook page. Ms Yukie Matsui, a Social Education Officer, introduced “Manmaruchi” as a family support project in the Enzan district. to spend time together. The activity became known as Manmaruchi. The word manmaru refers to “round and soft” in Japanese, and maruchi stands for “multiple and wider views of mothers”. Usually 10 or more mothers with children in kindergarten or elementary school participate in activities such as nail arts, confectionery making, household accounting and housekeeping, and preparation for elementar y school. One of the challenges facing the Kominkan is that participants come to enroll in existing classes but do not take the initiative to bring others or to suggest or develop other courses. The participants tend to see Kominkan as a provider and themselves as participants, or users of the service. Another challenge lies in its of ficial nature. Municipal funds pay for management and programme development. This means the Kominkan is accountable to the municipality, but methods are seldom shared among policymakers and researchers. Maruyama, H. (2011): “Social Education” System in Japan. Education in Japan. NIER. MEX T & ACCU (2008). 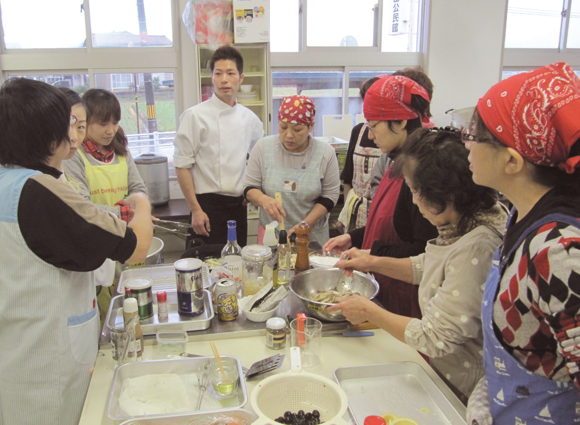 Kominkan Community Learning Centers (CLC) of Japan.